I finally had myself a piece of the asparagus quiche for dinner last night. It was pretty damn good. Honestly, critically, I would probably put more cheese in it next time. Other than that, though, I think it’s damn fine. Author peggyluwhoPosted on March 11, 2009 Categories foodTags asparagus, food, quiche2 Comments on Yes, it is Awesome! I have been cooking a lot lately. I don’t know if you’ve noticed. It’s actually for science. I’m trying to save money. Stay tuned for the big reveal about what I’m saving for. So, I’m trying to see if the theory that I will save so much money if I make my own food is true. I sort of think that maybe that might not work out, since buying for one is a lot more difficult than shopping for a family. It’s hard to buy just enough, without it going bad, and I can’t buy in bulk. Also, I’m trying to see if I lose any weight if I eat less “restaurant food”. I have been about 5-10 pounds heavier than I would like to be, which isn’t that big of a deal, but I’d like to get that back down. So, we’ll see how this goes. It’s hard to say how much money I am or am not saving, however I can say that I’ve lost a couple of pounds already. Of course, for other reasons, I also haven’t had any beer in the last week, so that might be responsible, too. Anyway, with that said, here’s some pictures of a quiche I just made. Of course, that’s for tomorrow. I’ll let you know how it tastes. Author peggyluwhoPosted on March 9, 2009 Categories foodTags cooking, food, scienceLeave a comment on For Science! 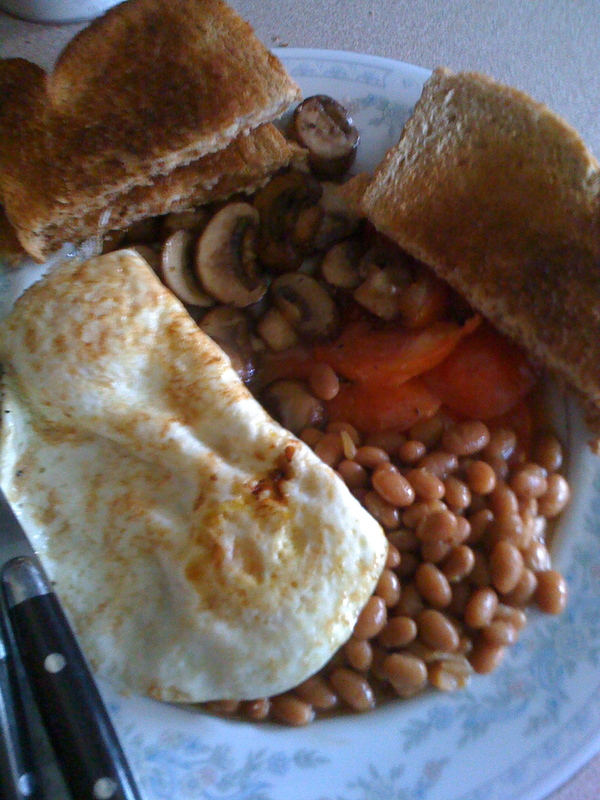 Grilled mushrooms, grilled tomatoes, beans, eggs, and toast. Yummy! I could eat that for days. It’s the enchanting scent of three days until payday and I’ve overshot my budget. A.K.A. a big slow cooker full of beans simmering in the kitchenette. It’s simple economics. If I eat at home for a few nights, and don’t buy any lunch, then it’ll really help me out going into this next weekend. Also, it’s probably better for me, too; it’s vegan and not really full of fat and empty carbs. It’s not chili, more like a stew with beans. I went to TJ, and I put a lot of my big Washington road trip on my credit card, so, you know, I’m not destitute, but I could stand to cut a few corners. Saute 2 diced medium yellow onions, 4-6 cloves of garlic minced, and a handful of chopped fresh cilantro in about a table spoon of olive oil with a dash of salt and pepper. While that is going, dice up 2 red bell peppers and 5 Roma tomatoes into the slow cooker. When your onions and garlic are about halfway done, add in a few cups of sliced crimini mushrooms. I used a whole package that I got at Trader Joe’s. Continue to saute until the mushrooms are softened, then add to the slow cooker. Add 1 can each of garbanzo, kidney, and black beans alone with 1/2 of a package of frozen corn. Then just let the slow cooker do it’s thing. So, it’s going in the kitchen. I think I’m going to leave it on low over night. Then I’ll have dinner and some lunches for the next few days. By the way, all the ingredients are from Trader Joe’s, too. I’m gonna get some sleep now, or try. Author peggyluwhoPosted on August 11, 2008 August 12, 2008 Categories foodTags beans, broke, cheap food, cooking, food, recipe, slow cookerLeave a comment on What’s that Smell?